Georgia Pine Over My Grandmother’s Grave, BlackBerry Shots, Augusta, Georgia, October 2009, all photos © 2009 by QuoinMonkey. All rights reserved. It happened to be two weeks before Mom and I were scheduled to travel to Georgia. After 50 years apart, the question’s answer led them to me. It turns out, my paternal grandparents are buried down the hill from my maternal grandparents in the same cemetery. I’ve been visiting the cemetery with my mother for years and never knew. 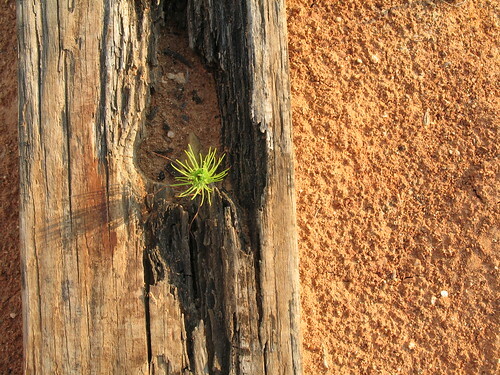 These photographs are of the pine tree that grows high over their graves. 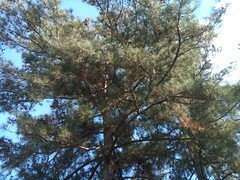 My Aunt Annette told me that my grandfather loved pine trees. So do I. When I was a child, I would spend hours sweeping pine needles, the scaly bough of a branch curving to make just the right shape, a prairie-style home. 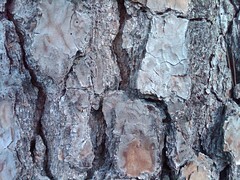 The thing about cemetery trees is that they are many times old growth trees, never to be cut. 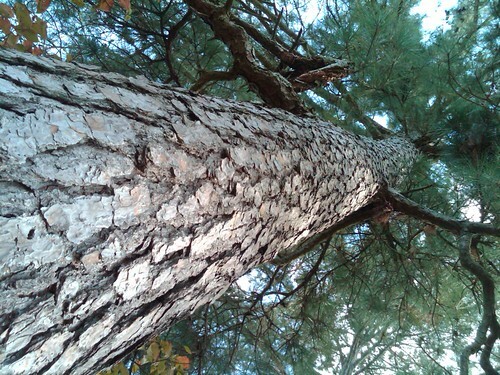 I like to think this pine is a guardian for my grandparents, its long roots extending deep underground, branches tall and proud (reminds me of another pine in New Mexico that I’m quite fond of, the Lawrence Tree). There is more to the story — a letter, an obituary, a ring. Perhaps another post. This week I give thanks for all who live, and those who have come before. Skin Of A Pine Tree, Pine Trunk In The Graveyard, My Grandmother’s Grave, Cemetery Pine, BlackBerry Shots, Augusta, Georgia, October 2009, all photos © 2009 by QuoinMonkey. All rights reserved. Post Script: the day Mom and I met my aunt at the cemetery, we also visited the Gertrude Herbert Memorial Institute of Art in Augusta. That’s where my Canon G6 battery died; I had forgotten to charge the backup battery. These photos are all taken with the BlackBerry cell phone camera. 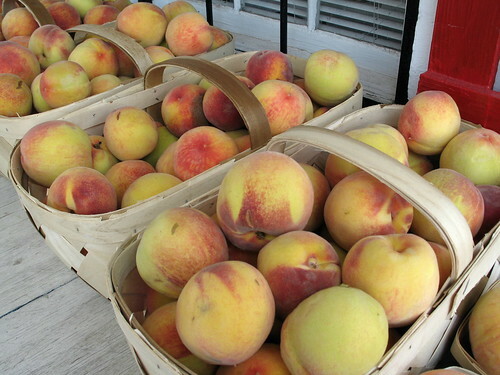 Georgia Peaches, small roadside market near North Augusta, South Carolina, July 2008, photo © 2008 by QuoinMonkey. All rights reserved. Post Script: Special thanks to my step-dad — well, I call him Daddy. But some call him George, and some call him Robbie, and some call him Big Daddy, and Liz calls him Sweet Lou — for carting us around Georgia and South Carolina the last few summers. This year he took us to this little roadside stand for fresh watermelon, okra, corn, figs, peaches and boiled peanuts. After Daddy left to drive to Tennessee for the funeral of his brother, and then on to Pennsylvania to help take care of my brother, Mom and I stayed on a while longer. We took one more late afternoon trip to the roadside stand the night before we left, and bought fresh boiled peanuts to cart back to my brothers, sister, and sister-in-law in Pennsylvania. While Mom tasted a fresh fig, the feisty Korean woman who runs the stand with her husband told me that for the last two or three decades she has farmed the land and made the South her home. She loves it there. And forever her home it will be. Lone Pine In Red Clay, Clarks Hill Lake, Georgia, July 2008, photo © 2008 by QuoinMonkey. All rights reserved. Passion Flower, (Passiflora Incense), Augusta, Georgia, July 2008, photo © 2008 by QuoinMonkey. All rights reserved. Life Blood (Of The Passion Flower), Not A Flower But A Vine, Augusta, Georgia, July 2008, all photos © 2008 by QuoinMonkey. All rights reserved. Post Script: I feel fortunate to have gotten these shots last week. I had never seen a Passion Flower up close; I found out later that many species only bloom one day a year (much like the Prickly Pear cactus). If Mom had not turned her head out the car window that day, I would have lived another year without experiencing this beautful flower in the flesh. 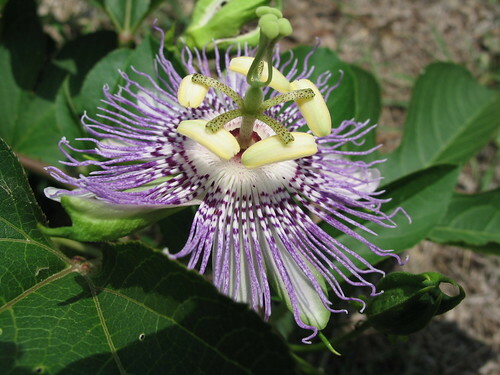 ABOUT THE PASSIFLORA: 9 species of Passion Flower (out of about 500) are native to the United States, found from Ohio to the north, west to California and south to the Florida Keys. Most are vines, some are shrubs, a few species are herbaceous. 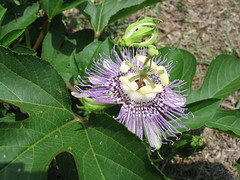 The fruit of the passiflora plant is called passionfruit. The bracts are covered by hairs which exude a sticky fluid that sticks to insects. Studies have suggested this might be an adaptation similar to carnivorous plants. ONE DAY: In Victorian times the flower (which in all but a few species lasts only one day) was very popular and many hybrids were created. HERBAL REMEDIES: The leaves and roots have a long history of use among Native Americans in North America. Passiflora edulis and a few other species are used in Central and South America. The fresh or dried leaves are used to make an infusion, a tea that is used to treat insomnia, hysteria, and epilepsy, and is also valued for its painkilling properties. Some contain beta-carboline harmala alkaloids which are MAOIs with anti-depressant properties. POLLINATION: Decorative passifloras have a unique flower structure, which requires a large bee to effectively pollinate. In the American tropics, wooden beams are mounted very near passionfruit plantings to encourage Carpenter bees to nest. Some species can be pollinated by hummingbirds, bumble bees, wasps; others are self-pollinating. WHAT’S IN A NAME? Passion Flower does not refer to love, but to the Christian theological icon of the passion of Christ on the cross. In the 15th and 16th centuries, Spanish Christian missionaries discovered this flower and adopted its unique physical structures as symbols of Crucifixion. The radial filaments which can number more than a hundred and vary from flower to flower represent the Crown of Thorns. The 10 petals and sepals represent the 10 faithful apostles. The top 3 stigmata represent the 3 nails and the lower 5 anthers represent the 5 wounds. KNOWN ACROSS THE WORLD: In Spain, Passiflora is known as Espina de Cristo (Christ’s Thorn). In Germany it was once known as Muttergottes-Schuzchen (Mother-of-God’s Star). In Israel they are referred to as clock-flower (שעונית). In Japan, they are known as clock plant (時計草, tokeisō). In North America they are also called the Maypop, the water lemon, and the wild apricot (after its fruit). Native Americans in the Tennessee area called it ocoee, and the Ocoee River and valley are named after it. Flannery O’Connor — The House I Grew Up In, Savannah, Georgia, July 2008, photo © 2008 by QuoinMonkey. All rights reserved. It’s almost time to leave the South. It seems like I’ve been gone forever. I had hoped to write more from the road but, I tell you, I’ve just been too exhausted when I drop into bed at night. That on-the-road research and writing takes a toll. And so does the heat. Yesterday it was 95 with a heat index of 108. Humidity like that saps my energy, and takes my breath away. This is the South of Flannery O’Connor. To really get to know a writer, you need to walk in her shoes, live for a while where she lived, breathe the air she breathed, visit the places she called home. 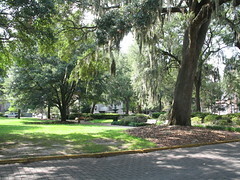 Flannery spent her childhood years until the age of 13 in the heart of the Historic District of Savannah, Georgia. 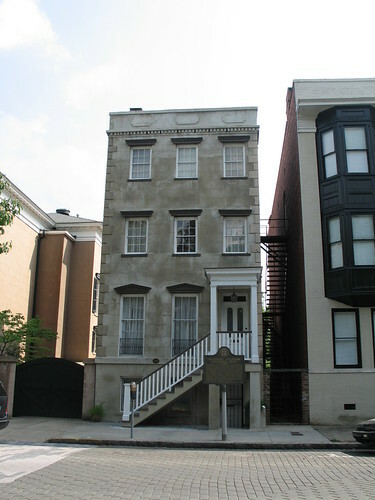 She lived in an 1856 Savannah gray brick home owned by her beloved Cousin Katie. 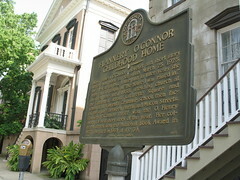 At the time the O’Connors lived in Savannah (from March 25th, 1925 to March, 1938 when the family moved to Milledgeville, Georgia) the population was three to four times greater than it is today. According to the notes from a talk by Bill Dawers at the O’Connor home last December, a dozen or more people might have lived in the modest home in Lafayette Square in a dwelling that now houses only two or three. Savannah was more integrated with regard to race and class in the 1930’s, too. 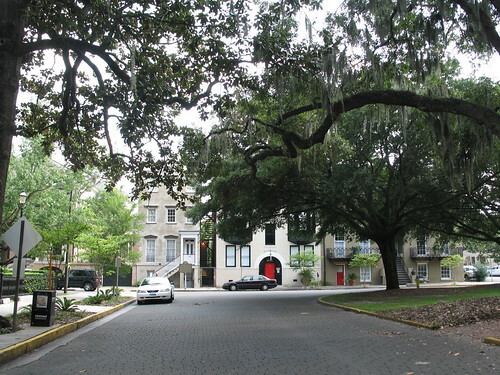 Before the automobile and the suburbs, nearly all Savannahians lived north of Victory Drive and people from all walks of life bumped into each other on Savannah’s city streets. The two days we visited Savannah were sweltering hot; the evenings surrendered to cool breezes pooling off the river. We ate at a place called Moon River and walked through Greene Square (one of Oglethorpe’s many city squares) on the way back to our hotel room that night. 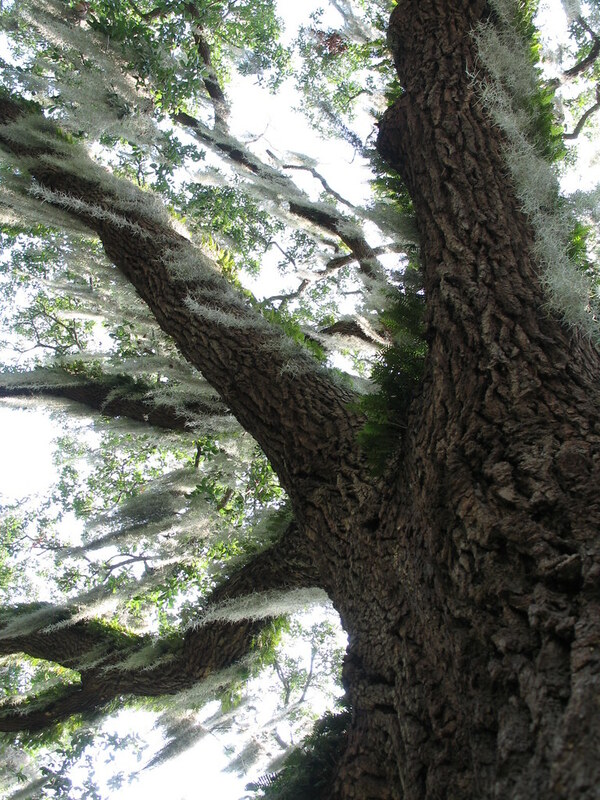 Our visit was brief, as we spent most of our time down on St. Simons Island about 80 miles south; every minute counted. Our last stop heading out of Savannah was Flannery’s childhood home in Lafayette Square. She could see the spire of the Catholic church where her family worshipped from their second story bedroom. The Flannery O’Connor Childhood Home Foundation celebrated her March 25th birthday on Friday, April 11th, by having a cookout and celebratory burning of the 207 East Charlton Street mortgage papers that had just been retired. Their vision of establishing, preserving, and maintaining the birthplace of writer Flannery O’Connor began in 1987. I am grateful for their perseverance. A generous donation from Jerry Bruckheimer (whose wife, Linda, has long been a fan of O’Connor) restored a 1950’s kitchen back to the family library where Flannery learned to write and read. Many people have donated time, money, and original family furnishings, and the Florencourt Sisters, Louise and Frances, keep the aim true to the writer. It’s a partnership between many that works for the good of all. My small donation was to purchase a few books before we left and the friendly and knowledgeable guide closed the doors for the day on Flannery’s childhood home. One came highly recommended — The Letters of Flannery O’Connor: The Habit Of Being. The guide told me if I want to learn about writing, read Flannery’s letters. I highly recommend them. Flannery called herself an “innocent speller” and I’m encouraged to see the humility she embodied through her casual misspellings and religious letter writing. Before she flew back to Minneapolis earlier this week, Liz and I started reading the letters out loud to one another. My favorite time was sitting over Clarks Hill in the sultry afternoon heat, barely able to move, with the neighbor’s peacocks welting out their prehistoric caw in the distance. Flannery loved peacocks. In fact, she loved all birds, domestic and wild. Her letters are full of fowl references and a wicked Southern sense of humor that rattles my funny bone (I can relate, having grown up with it myself). The Habit Of Being is a thick tome. I’m reading her letters in chronological order from beginning to end. The sweat that pours off of me each day I’ve spent in the South only reinforces childhood memories of the slowness with which people move, the Southern drawl that rolls off the front of the mouth, the sweet iced tea and grits, the longing for that one next simple breeze. Flannery died in 1964 at the age of 39. She suffered from lupus. It did not keep her from writing two collections of short stories (A Good Man Is Hard To Find, Everything That Rises Must Converge) and two novels (Wise Blood, The Violent Bear It Away), and winning the O. Henry Award three times as well as being the posthumous winner of the National Book Award in 1972. Flannery lives on in her work and the lively letters edited by her close friend, Sally Fitzgerald. It is to this end, that our childhood homes hold the weight of being. Think about the house you grew up in. Is it surrounded by farmland, an urban parking lot, mountains, desert, rivers or streams? I travel back to the quicksand, red clay, and gangly pines of the Southern hometown where I spent my childhood (same years as Flannery, birth to 13) in hopes of learning what I am made of. I always drive by the house I grew up in. It’s a part of me that has taken years to understand. I’m still gathering like a maniac. I’m still unraveling. all photos © 2008 by QuoinMonkey. All rights reserved. We were not permitted to take photographs inside the Flannery O’Connor home except in one location. I did capture a few images of the writer there. But I think I’ll save them for Part II. Part I is about home and the sense of place that surrounds us growing up. In Part II, I hope to talk more about what I’ve learned about Flannery from her letters, visiting her Savannah home, and the way she lived her life. 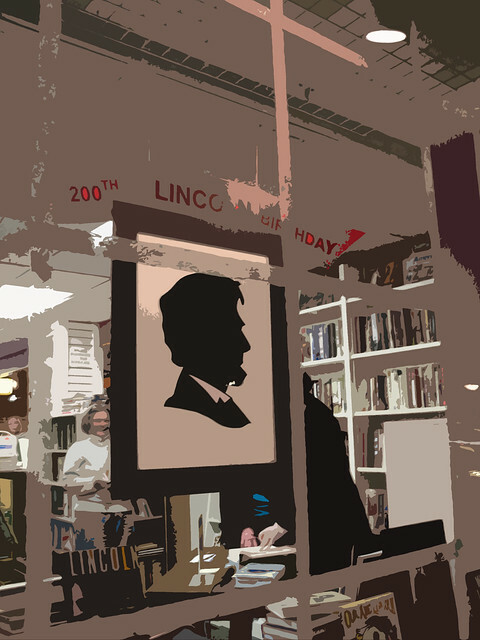 -related to posts: Homing Instinct, You Can’t Go Back – 15 Haiku, Memories Of The Savannah, Excavating Memories, Book Talk — Do You Let Yourself Read? Live Oak, Epworth By The Sea, St. Simons Island, Georgia, July 2008, photo © 2008 by QuoinMonkey. All rights reserved.